A couple of days ago I was out rezeroing a coyote rig (243 XP-100 pistol--2.5-8X Nikon Force pistol scope). Mom was along as spotter and I always go straight to the 425-yd. range that has steel setup at 200 and 425 yds. The problem is that at 200 yds. the steel tgt. is elevated with bushes all around, and it's almost always difficult to see bullet impact if you can't hit the steel. But the 425-yd. steel has a lot of open area all around it which provides for a great resource for observing bullet impact. What I did was boresighted with my eye through the bore at the 425-yd. target and since I know that at 400 yds. the bullet drop is ~6 MOA with most of my long-range pistols, I crank in that compensation UP into the turret and shoot. Mom spots and calls correction then I measure ~MOA correction using the 2 MOA Nikon BDC circles, shoot again to ensure 425-yds. is right on and then crank 6 MOA down, and fine tune on the 200-yd. steel. This can really be done at any distance once trajectory is known. There are many ways angular math vs. optics can be applied to accomplish a particular task, that's not only practical but rewarding too. Makes a sight-in session more fun IMO. How do I zero with that, huh? Very good post CFII. Well done. When selecting the best air rifle scope with reviews, there are a few important things to keep in mind. My Omark M44 7.62 service rifle is not that consistent. Thank You. This is very easy to follow. Great shot. Where can i get a pistol that only drops 6moa out to 400 yards? This is still one of the best one liners ever!!! I have a Minox tactical 5x25 and the adjustment dial says each click is 1/10th of mm. Isn't that like .03 of an inch? I am having one heck of a time with tracking and setting final zero. All help will be appreciated. .4 BC @ 2750, 225 zero is about 24" low at 425 or ~6 MOA. 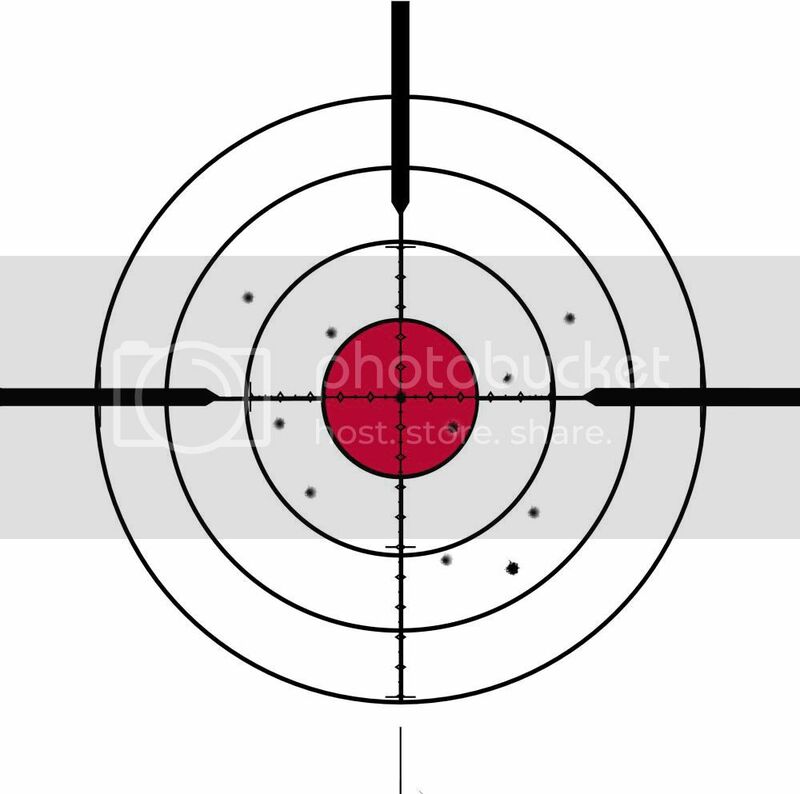 Instead of dialing in your windage, because the wind is varying, just measure it with your scope and hold however far off your splash in the dirt was to the side of the target in the opposite direction. What is a mil? "Well it's 3.6 inches at 100 yds or 3 ft at 1000 yds." Seemed kinda arbitrary to me. And as I say I gotta sometimes figure things out myself. So here's what I found out. Something I couldn't find out here or in any Google search I did. Maybe it's too obvious. Maybe I didn't look in the right places. But anyway, here goes for the mil/mil virgins. A mil. is not based on yds. It's based on meters. I mil. is 1 meter @ 1000 meters. 1 mil is 10 centimeters at 100 meters. Which makes those 1/10 mil clicks make so much better sense. So save yourself a headache and set your rangefinder to meters. Oh. And when you check your ballistic charts forget inches and just go with mils. You can still read your charts in yds if you prefer, but read windage and elevation compensation in mils. Also, if any of this is wrong then please delete. I am a mil. virgin after all. sabredoc, mils, like MOA, are an measurement of angle. While it can be easier to translate them into a linear measurement at a specific distance using metric units, mils are not based on the metric system. You are correct in stating that it's better to forget linear units (inches) and use the angular units (mils/MOA) to make adjustments. I mean if you're say, .5 mil high at 500 yds you'd adjust .5 mil which is 5 clicks. Each click being 1cm. Angularly you adjust the reticle upward which would mean to be on target your barrel downward. Practically, it doesn't really matter because you are on target? If mil. is not based on the metric system then why does a mil just happen to be 1 meter/1000 meters. 10 centimeters at 100 meters with each click just happening to be 1 cm at 100 meters? Please don't take offense, I'm just trying to learn here. Crap. 5 centimeters at 100 meters. 25 centimeters at 500 yards. That's the problem, you need to stop thinking about clicks, inches, centimeters etc. If you take a shot and you can see with your mil reticle you were .5 mils low. Then you make the adjustment for .5 mils and shoot again. There is just really no need to bring linear into it. .5 mils at 100 yards is .5 mils at 500 yards and still .5 mils at 1000 yards etc. When you bring linear into it, then you have to start figuring, 1 inch at 100 yards, 5 inches at 500 yards etc. Its just a whole lot easier to forget that part of it. Thats one great thing about a lot of scope manufacturers today. They are making scopes with matching mil or moa adjustments and reticles. Makes it so there is almost no thinking about it. Everything is just super easy. Yep. I appreciate all the help. Maybe I can sleep tonight! Believe it or not I woke up last night thinking about this. Hey Doc, where do you shoot here in the heart of Dixie? The 10x42 M.D.SS I got has mil reticle and 1/4moa turrets so it is more complicated for me. Something I REALLY like about the 1~4x24 SS Classic I got. . Mil reticle let mil turrets. In the future all scopes I get other than for a heavy rifle. Will be mil/mil. The extra math is debilitating for me. But . The article or op is super. I'm looking forward to a mil quad, 3~9x42 or the 3~15x42 MQ.